As part of the Premier’s Science and Research Fund (PSRF), the State Government is providing $1.35 million over three years to establish a TREND Line to monitor the agricultural and ecological impact of climate change. 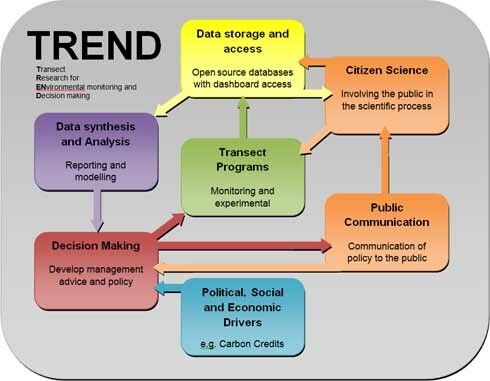 TREND is a collaborative initiative between the University of Adelaide, the Department of Water Land and Biodiversity Conservation, Department for Environment and Heritage and the South Australian Research and Development Institute. Together these partners will establish the South Australian TRansect for ENvironmental monitoring and Decision making. “The TREND program will provide an early warning system for ecosystems shifts due to climate change, helping to plug a fundamental gap in our knowledge about how natural and production systems respond to this change. This will lead to improved modelling that will help inform effective management decisions for the future,” said Professor Andy Lowe, Director of the Australian Centre for Evolutionary Biology and Biodiversity (ACEBB), the Environment Institute. The TREND program will deliver a study of economically and ecologically important systems, running from Adelaide north through the Mt Lofty Ranges, the Barossa and Clare Valleys to the rangelands and eventually into the northern desert areas of the State. This project will involve and engage the wider community, by providing a forum for direct public involvement in data collection. Over the next five years, it will provide resources to assist managers of natural and agricultural systems to incorporate climate change into their planning. Ultimately, it will provide a legacy of high-quality monitoring for future generations. “The TREND line will provide vital data needed for research in climate adaptation and the development of effective and innovative approaches to sustaining our environment and securing our economic future,” Premier Mike Rann said. “This is the most significant investment in climate change understanding on the ground for any state or territory in Australia,” Professor Lowe said. People are not speaking out loudly and clearly about the colossal threat that is posed to humanity by the skyrocketing growth of human population numbers on Earth. Despite the unfortunate, inhumane ways a “ONE CHILD PER FAMILY” policy was implemented in China, the policy could be vital for the future of humankind and life as we know it in our planetary home. The immediate, free, universal and compassionate implementation of a voluntary “one child per family” policy could decisively limit adverse, human-driven impacts on Earth’s body and its environs, and do so more powerfully than any other conceivable human intervention. Given the already visible, converging global threats to human wellbeing and environmental health that are presented to the family of humanity in our time, the humane implementation of one child per family could be an indispensible centerpiece of a set of adequately designed, actionable programs that serve to actually rescue a good enough future for the children and coming generations. If a root cause of the global threats on humanity’s horizon now is the unbridled growth of absolute global human population numbers, our willful denial of this primary cause could make it extremely difficult, if not impossible, for the children to reasonably address and sensibly overcome these threats. Then the children are likely being directed down a “primrose path” to confront some unimaginable kind of ecological wreckage, the likes of which only Ozymandias has seen. The children will not understand why the catastrophe is occurring. Because their elders refused to acknowledge the best available scientific evidence of human population dynamics and, therewith, adequately “diagnose” the distinctly human-induced global predicament all of us face now, the children will not know what hit them, why it is happening, and what is required of them so as not to commit the same mistakes made by the elders. This is only a guess but please note the likelihood that history will not be kind to the woefully inadequate leaders in my not-so-great generation of arrogant, extremely foolish and avaricious elders.